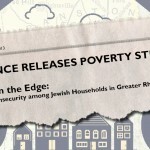 The Jewish Alliance of Greater Rhode Island, with the support of Alan Hassenfeld, commissioned Brandeis University’s Steinhardt Social Research Institute to examine the economic status of Greater Rhode Island’s Jewish community. Data indicated that half the Jewish households in communities served by the Alliance are financially fragile. Although the Alliance continues to address the issue of poverty and strives to meet the Jewish needs of our constituents, the study illustrates how dire the situation is and demands that a new strategy be taken. The Alliance is responding with an effective, respectful and fundamentally Jewish approach, and community partners will continue working together to implement a multi-pronged plan in the near future to address the issues this study has illuminated. The recommendations within the study include more comprehensive intervention strategies to protect the most vulnerable members of our community through services, support, and advocacy. Read more about those affected by the findings and the reaction from community leaders.